After an initial jump shares in Solgold plc (LON, TSX:SOLG) were trading flat by lunchtime on Wednesday after the company, worth $865m on the Toronto stock exchange, released the maiden resource for the Alpala target at its massive Cascabel copper-gold project in northern Ecuador. The latest in a string of announcements from Ecuador, where the Brisbane-based company have completed 63,500m of drilling not only shows the sheer size of Alpala, a porphyry deposit located on the Andean belt, the world’s richest source of copper, but a substantial high-grade "core" within the orebody. Alpala Maiden Mineral Resource Estimate across both Indicated and Inferred classifications totals a current 1.08 Bt @ 0.68% CuEq (7.4 Mt CuEq) at 0.3% CuEq cut off, some 40% of which is in the Indicated category (by tonnage). Contained metal content totals a current 5.2 Mt Cu and 12.3 Moz Au, some 45% of which is within the Indicated category (by contained metal). A further 100 Mt @ 1.0% CuEq (1.0 Mt CuEq) is added to the high grade core if a 0.9% CuEq cut off is used, some 50% of which is in the Indicated category (by tonnage). Estimate completed from 53,616m of drilling, approximately 84% of 63,500m metres drilled to date. Assay results still pending for a further 9,844m of drill core (16%) of the total to 21 December 2017. Strong potential for further growth in the deposit from pending assay results from recent drilling, conversion of current inferred to indicated mineral resources, and discovery of additional mineralisation in unclosed areas such as Alpala East, up dip Alpala Central, and Alpala North West and South East. "That the maiden MRE is so big, achieved with so few drill holes and that such a large percentage is in the indicated category is testimony to the size of the system at Alpala"
Solgold, which has $110m cash in the bank, said 11 diamond drill rigs are currently active at Cascabel and another starting up this month. 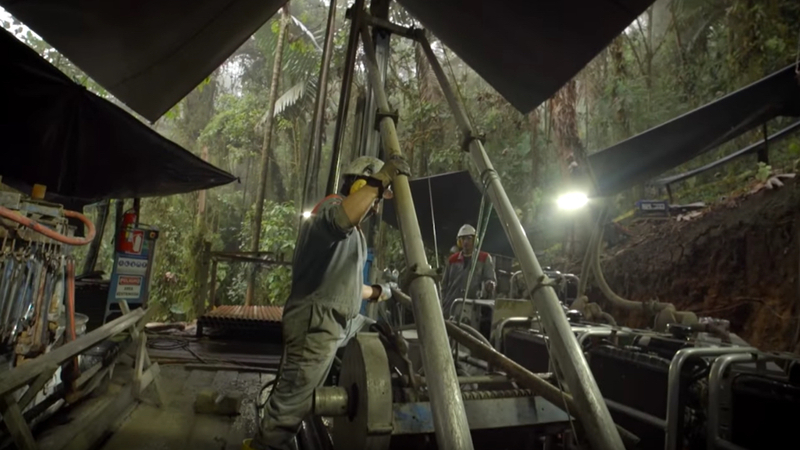 Solgold plans 120,000m of further drilling at Cascabel in 2018. SolGold's CEO and Managing Director, Nick Mather, said in a statement: "This maiden Mineral Resource Estimate (MRE) is a tremendous start and in our view by no means represents a final size or grade because the deposit is still growing. That the maiden MRE is so big, achieved with so few drill holes and that such a large percentage is in the indicated category is testimony to the size of the system at Alpala. "SolGold plans to announce updated MRE statements throughout 2018. We plan to immediately follow this maiden MRE up with initiation of a PEA (Preliminary Economic Assessment) of the deposit at Alpala, towards commencement of the PFS (pre-Feasibility Study) later in 2018." The company has in the past pointed out that Cascabel has produced “some of the greatest drill hole intercepts in porphyry copper-gold exploration history” and calls attention to Hole 12 which returned 1,560m grading 0.59% copper and 0.54 g/t gold including, 1,044m grading 0.74% copper and 0.54 g/t gold. SolGold owns 85% of Cascabel located 180km north of the capital Quito, with the remainder held by Cornerstone Capital Resources (CVE:CGP). Shares in TSX Venture‐listed Cornerstone declined on Wednesday, dropping its market value to $159m. Australian gold miner Newcrest Mining owns 14.5% in SolGold. Newcrest, the world’s sixth largest gold producer, put Craig Jones, the top exec at its giant Wafi-Golpu block caving project in Papua New Guinea, on the board of Solgold in March.